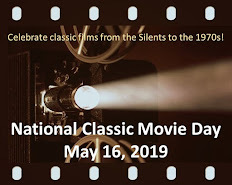 When the idea for the 31 Days of Halloween was first proposed I tried to think of the scariest motion picture or television show that I'd ever seen; Psycho, The Exorcist, Don't Look Now, Jaws, Alien, Aliens came quickly to mind. It was harder remembering a television show that chilled me to the core. I thought it was "A Feast of Blood" from Night Gallery; however, when I viewed it on line it seemed rather tame and silly. But while doing research I came across what many consider to be Night Gallery's most famous production "Caterpillar". When I read the synopsis I instantly knew that this was the episode that had caused many a nightmare and reinforced my fear of earwigs, those ugly little bugs with nasty looking pincers at both ends of its body. Set on a tobacco plantation in the steamy jungles of Malaysia, the teleplay depicts the deterioration of one man's already diminished soul by the unyielding forces of nature, the constant rain and debilitating heat, and his increasing boredom and dissatisfaction with the social restrictions inherent in the life of a European plantation owner. And whatever is left of his morality and integrity disintegrates into a murderous lust for the young wife of his much older employer. Steven Macy (Laurence Harvey), disillusioned with his life in England, signs a one-year contract to work for a tobacco grower in Borneo. His employer Mr. Warwick (Tom Helmore) is married to a much younger and stunningly beautiful woman(Joanna Pettet). Macy erroneously believes that the lovely Mrs. Warwick is unhappy in her marriage and begins to make unwanted sexual overtures to her which she quickly rebuffs, declaring that she loves her husband and plans to be with him forever on the plantation. 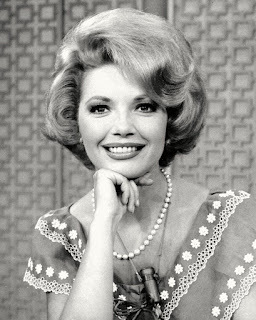 In s pite of these blunt rebukes, Macy's obsession with Mrs. Warwick escalates to a dangerous level. Robinson (Don Knight), a felon who chose deportation to Malaysia over serving time in a London jail, continues his unsavory dealings in the local village, lurking around in seedy pubs, trespassing on private property, offering his questionable services for hire. On one of his forays onto the Warwick plantation, ostensibly to sell kindling, he witnesses one of Macy's failed attempts to woo Mrs. Warwick. He recognizes Macy's untenable situation and presents a way to solve the problem. He tells Macy about a little beastie called an earwig which likes to feed on wax. Supposedly, if one of the little critters gets into your ear it will eat the wax, but unable to move backwards, it continues boring through the brain causing unimaginable pain as it seeks a way out. This results in the death of the earwig and its host. Macy is appalled at the implication that murder will be done, but tells Robinson to do it as soon as possible, that very night, and pays him 100 pounds to place the earwig into Mr. Warwick's ear. The next morning at breakfast Macy intently watches his employer for any signs that something is wrong, while noticing a strange feeling in his own ear. This increases in intensity and when Macy holds a handkerchief to his ear it comes away bloody. The realization that the earwig was placed in his ear drives him screaming from the room. What happens to Macy over the next two weeks is disgusting and horrific and sickening. He lies in the bed, hands tied to the bed post to prevent him from scratching his face off, his countenance twisted with the unbearable agony he suffers. When Robinson appears at his bedroom window to "apologize" for the "mistake", Macy painfully and slowly utters, "I... want... to... die". But he doesn't die! The earwig reached his opposite ear and fell out. Macy confronts the others, expecting to be taken to jail and tried for attempted murder. He tells them that being tortured on the rack, flayed alive, and even hanging would be preferable to the excruciating, persistent, driving itch caused by the earwigs journey through his brain. Mr. Warwick informs him that there will be no arrest and no trial in Malaysia or England. Macy realizes that there is something they are not telling him and after Mrs. Warwick is asked to leave the room, the doctor tells him why he he won't be suffering any punishment from the law. The doctor was the one who caught the earwig as it fell out of Macy's ear; he killed it and discovered that it was a female--and a female lays eggs. There is no reaction shot of Macy and as the screen fades to black, we hear a bloodcurdling scream of terror emanating from the house. The most amazing thing about this episode is that the horror is not derived from graphic depictions of bugs and blood, but rather from the brilliant, descriptive teleplay by Rod Serling. The fear and disgust we experience does not result from gratuitous scenes of the earwig plowing through Macy's brain or blood gushing from his mouth or nose. There are no close-ups of the doctor squishing the bug. It's in the telling of the story in such a way that our imaginations are given free reign to conjure up our own versions of the hideous images and unrelenting pain suggested by the script. The actors get their jobs done by accurately delineating their characters and setting up the interactions that follow. The lovely and talented Joanna Pettet is the perfect object of desire, her radiant beauty a forbidden fruit for Steven Macy. 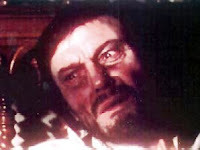 But it's Laurence Harvey's terror filled eyes and quiet moaning, his pain ravaged face, his disheveled and unwashed appearance, lying in bed with his hands tied to the bed posts, that enhance the elements of horror, disgust and fear in Serling's script and make "Caterpillar" one of Night Gallery's scariest episodes. 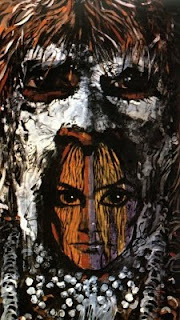 Saz, this brought back some memories as I hadn’t seen NIGHT GALLERY in a long time. In fact, your blog sent me to Hulu to watch this episode. What I loved about it was the atmosphere: the endless rain, the disturbing lighting (especially how Harvey’s eyes are lighted almost like a pair of goggles in one scene), and the use of windows & doors. The last comment sounds odd, I know, but the centerpiece of the first set is a large door leading from a sitting room to the outdoors (I immediately thought of Saki’s short story “The Open Window”). My favorite scene is when Robinson stops by Macy’s bedroom window to apologize as Macy lays in agony on his bed. Anyhow, this was cool pick for the 31 Days! Great pick for a subject of your really wonderful article. That episode scared the hell out of me when I first saw it, and my ears itched, no kidding. I think Laurence Harvey was really ill at the time they made this if I'm remembering right. He died really young. His performance was just as you said, and he made everyone feel his agony. That's an episode you never forget once you see it. Thanks (?!) for the reminder! My ears itch now. Wow! What an intensely visual description of a truly horrifying story! I haven't seen this episode but I honestly feel as if I have. The theatre of the mind is so vivid and can be the most frightening perspective of all. Saz, this was a magnificent review of an excellent, and very appropos, addition to the Cafe's 31 Days of Halloween. Harvey's terror filled eyes have made an indelible impression on the ides of October. Exemplary entry! sazball , iam going to run over to hulu to watch this episode.i will be back to tell you how i liked it..
Sazball: I saw this one when it first aired and can never forget it. That can probably be said for anyone that had the experience. "I want to die," says Harvey. "Oh, you will, young gentleman." Man, I still get chills. As Becky as noted, Harvey was dying of Cancer at the time, so his Young English Gentleman, pale as alabaster, lashed and writhing to his sweat soaked bed, takes on a particular significance in retrospect. One can only imagine what went through the actor's mind. "I want to die." Just one of the most classic moments in television history. Wonderful post! This show sometimes gets forgotten due to Twilight Zone. I found the portraits/paintings shown at the episode's start as well as the intro by Rod Serling to be a great in setting the tone. This painting that you included from the episode certainly is disturbing -- I'm so glad you included it with your piece! • Laurence Harvey was already being treated for the cancer which would take his life the year after this episode was aired. To convincingly depict his character's pain and agony, he briefly stopped taking the painkillers prescribed by his doctor.